Following the Dec. 14 FOMC meeting, Money Morning Resource Specialist Peter Krauth's bold gold price prediction shows how high prices could climb heading into 2017. "I think the price of gold will remain challenged in the near term, but within a matter of weeks we could see it resume its natural bull market stance," Krauth said on Dec. 9. "The fundamentals remain conducive to higher gold prices, and the fundamentals always win out eventually. Patience will certainly be rewarded." Urgent: Rare gold anomaly – an event so rare, it's only happened twice in 20 years! And it's about to happen again. Find out more. You see, Krauth is focused on the long-term prospects of gold prices rather than just a singular event. Investors who make the most gains are always forward-looking. 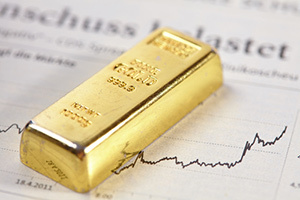 There are two reasons why gold prices are volatile. The first is the Dow Jones Industrial Average has surged since President-elect Donald Trump's victory. Many experts expected the stock market would crash after Trump won, but the Dow has climbed over 8% since Nov. 8. With the Dow climbing, gold has been falling. Gold prices have dropped 8% since Nov. 8. That's because gold is viewed as a safe-haven investment during times of uncertainty. It's an investment that could offset losses from stocks. But gold prices won't provide the same type of returns as a surging stock market. That's why investors are putting their money into stocks rather than gold right now. The second reason gold prices are volatile is the strong U.S. dollar. On the day of the election, the U.S. Dollar Index opened at $97.86. Today the index opened at $101.71, a 3.93% increase in roughly a month. Because gold is priced in U.S. dollars, it becomes more expensive for foreign investors to purchase gold when the dollar is strong. For example, the euro is worth $0.94 for every dollar, and the pound is worth $0.79. "It's a familiar narrative, but still the anticipated December Fed rate hike is being assigned a 97% probability. 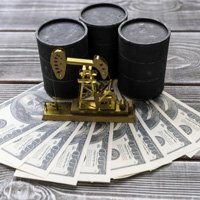 That's kept the dollar strong, and that means it competes with gold, weighing on its price," Krauth said. exists honesty in the USA??? I doubt it.